Glass inserts provide a safe view of the flames without distracting from the ambiance or warmth of the fire. 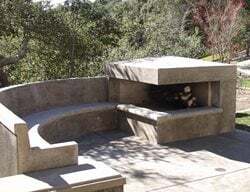 This pear-shaped concrete fire pit was cast from a mold hand sculpted from rigid foam. The design intent was to create a distinct architectural piece for a rooftop lounge. The counters, hearth and mantel of this fireplace are all poured concrete. 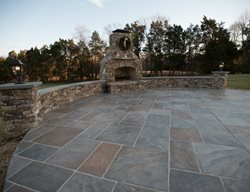 Winner of a 2012 ASCC Decorative Concrete Council Award - First Place Certificate for Cast-in-Place Stamped, Under 5,000 SF. 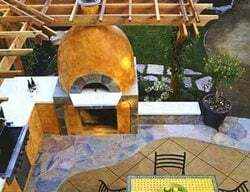 This homeowner’s backyard was transformed into an alluring year-round destination. It is now a diversified area created for outdoor cooking, relaxation, entertaining and fitness. At the far end of the pool is a large stone veneer fireplace with retaining walls and precast stones. 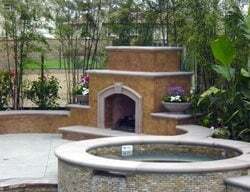 There is also a large fire pit surrounded with masonry sitting walls. The pool deck is 4,200 sq. 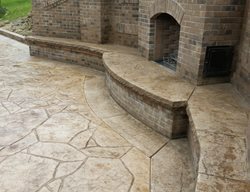 ft. of stamped concrete. Three stamp patterns were used with color hardeners and random acid stain highlights. 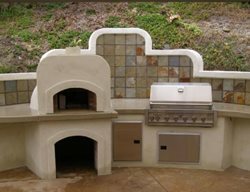 The coping is custom cast stone. We poured this counter using recycled glass and colored cement (cast in place). 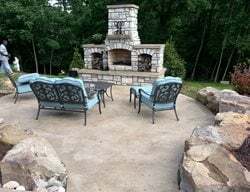 The owners decided to have a wedding for a friend and needed to finish their outdoor fire place. We had less than a week, so building the counter in the shop was out.With the help of Dave Wilber of Monterey Bay Cast Stone the Diamond D boys pulled it off. The upper front and inside is copper,the bottom is tile, and the sides and top are stucco.The fire magically appears coming out of a trough filled with recycle glass. 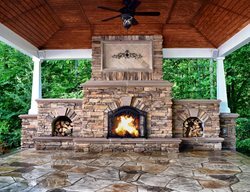 This eye-catching backyard fireplace and surround were created using Fossilcrete’s vertical overlay and colored with custom colors. 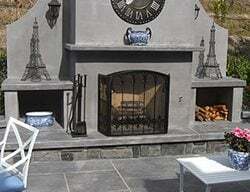 The patio was stamped with an Italian slate pattern and colored. Newlook stains were used to transform an existing patio area and existing walkways on this contemporary home. The textured and bordered concrete was plagued with oxidation and erosion. 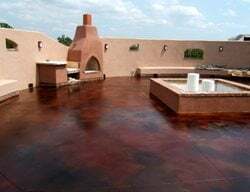 Read more about how this project was completed, including before and after photos of these existing concrete surfaces. 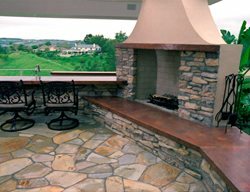 This outdoor kitchen and fireplace designed by the homeowner features a bi-level bar and cook area which proved to be a winning combination. A cantilever edging surrounds this massive fireplace and was also used on the bar. The concrete was acid stain and sealed.